Secure your iPads and other Tablets without taking off bulky protective covers! 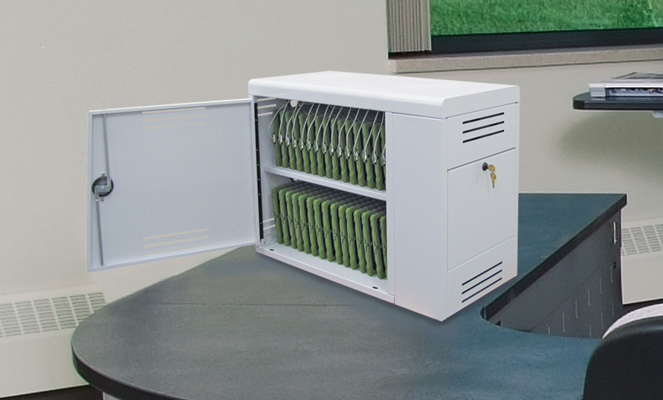 Stationary, secure and ready for up to 32 iPads or other tablets, the InTouch32 Secure Tablet Locker is just what you need to manage your 1:1 tablet programs while keeping the devices safe and secure within the classroom. 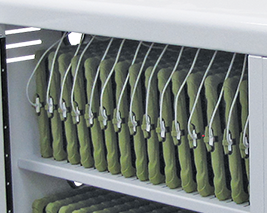 The IT32 Locker was developed directly from our customers’ requests for a better way to individually manage tablets. The large capacity of the IT32 allows instructors to more easily manage the entire tablet inventory in one location. Careful consideration is given to cord management by having a charging plug in front of every slot for easy tablet organization. A separate locking bay for the cord management and outlets keep connections intact and away from students. Think "secure" when you think of the IT32. Your expensive tablets are secured with Spectrum’s custom 2-point double-bolt lock and all steel - 16 gauge - construction. There are no plastic pieces to be pried open. Further protective measures can be taken by either bolting the IT32 horizontally to worksurfaces or vertically to walls. And don't waste time with removing and replacing bulky protective covers. The IT32, like in the IT40 Tablet Cart, has tablet slots that are wide enough to to handle the bulkiest of the covers like the Otter Box Defender and Griffin Survivor. For the ultimate in 1:1 device security and organization, look no further than the InTouch32 Secure Tablet Locker by Spectrum Industries, Inc!